I am falling into a certain relaxed rhythm. I still have my coffee and now I am writing with a knife-sharpened pencil on a mini yellow legal pad. I am unplugged. 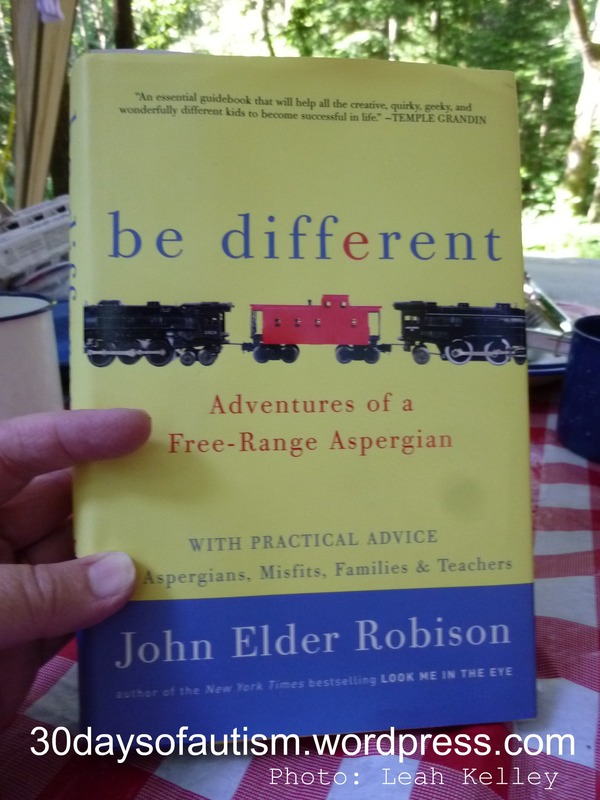 I have been reading John Elder Robison’s new book, be different: Adventures of a Free-Range Aspergian. I was inspired by his previous book: Look me in the eye: my life with aspergers, and I have been eagerly waiting for a space and place where I could settle down to consume his latest work relatively uninterrupted. Robison’s new book is an insightful peek into the perspective of an adult with autism. There have been parts when I sighed, nodding, open-mouthed: Aaahhhhh – I see! As I read it, I am encouraged that we are on the right path with H. I don’t mean the perfectly right path as there is likely no such thing – or if there is it eludes us still. I am fine with that. As I have said before, as parents The Amazing Craig and I are a work in progress. “Today I meet moms who cut the labels out of their kid’s clothes and trim the seams. The first time I heard this, it sounded great. What a nice thing to do, I thought. But when I thought about things a little more, I began to question the wisdom of that. Why? Because removing the irritants doesn’t do anything to decrease our sensitivity. And if clothes tags bother us today, and we don’t address the nuisance head-on, where will we be in ten years? Naked at work? Robison goes on further to explain that it was a more complex process than to simply ignore the sensory issues, but his perspective is certainly worth more than passing consideration. I have written previously about resiliency, anxiety, and learning to handle discomfort. (Coping with Anxiety…). We were told that Sensory Integration Dysfunction (now termed SPD: Sensory Processing Disorder) is best treated with a “balanced sensory diet.” H was sensory seeking in many domains, and sensory avoiding or tactile defensive in others. Here are a few of the things we did to address his sensory needs – and I must admit that we found economical, practical, and effective ways of doing so. • When he was around 3 years old, we had a pillow tent in his room. This was an inexpensive pop-up style tent that we filled with pillows and stuffed animals. So he was able to burrow into his stuffies when the world got to be too much and the closeness of the area calmed him. During the day we just lifted the tent onto his bed so that he had room to play, and we moved it back onto the floor at bedtime. • When we went to a social event at Grandma and Papa’s (at times very overwhelming) we made a sensory safe place away from home by putting pillows in Grandma’s en suite bathtub. (Note: H was not one of those kids who ever got into stuff – so we were comfortable with this.) We wanted him to begin to self-monitor and self-regulate and be able to remove himself or ask for time apart if he needed it, without feeling like he was in trouble. • I would have him carry a heavy item from the groceries (like a case of pop) to the car on the occasions that he came on a short shopping trip, and I still do this. He loved to drag big logs around at the beach and in the woods… he still does! • He also calmed when digging with a shovel, and vacuuming (ah… I miss those days) so we tried to make lots of opportunities for these kinds of activities. • When he was 4 or 5, Craig used to set him up with an old brick in the backyard, complete with safety goggles, a cold chisel, and a hammer and he would break up an old brick and then sweep and vacuum with the shop vac. He could really go to town and he is the kind of guy who loves LOVES using tools. • He would wear a backpack weighted with books on outings. Books were a great choice because hearing stories additionally calmed him. H often came home from school with rocks overflowing in his coat pockets… In retrospect – I think he was creating his own weighted clothing articles. So I suppose I must agree with Robison’s general premise about learning to handle discomfort. I think that as parents of these amazing and unique children, we are always working to balance our interventions with the child’s current ability and needs and we as we are also considering whether our strategies are creating difficulties rather than diminishing them. This is indeed a tricky place to be, and it often has us observing and re-assessing our responses and attitudes. I think that is OK: we don’t always get it right the first time. We are very pragmatic – and if we need to change a plan or a strategy – we will most certainly do so. Nevertheless, our experience has been that providing H with a balanced sensory diet has really assisted him in integrating his sensory experiences and processing ability. We found/created many other inexpensive and practical ways to address H’s sensory needs and to help him work toward integrating his sensory system more effectively… And I will be going into more depth with those strategies and ideas in: Providing a Practical Sensory Diet: the second course …coming soon to an autism blog near you!! This entry was posted in Aspergers, Autism, discomfort avoidance, Sensory Processing Disorder and tagged Aspergers, Autism, be different, behaviour, calming strategy, Carol Stock Kranowitz, John Elder Robison, Sensory Issues, Sensory Processing Disorder, SPD, Tags, The Out of Sync Child, Weighted clothing. Bookmark the permalink. A sensory diet worked wonders for my boys. 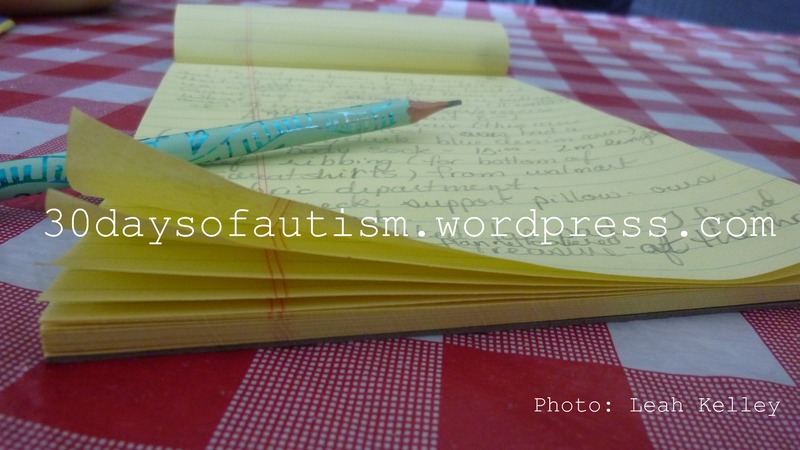 I was lucky enough to have an Autism Behavioural Specialist early on who told me about it. She then gave me a list of ‘things to try’ and we tried them all. What worked for one was heavy pushing and pulling (doors, garbages bins to the curb, sweeping etc) and a fidget toy. With my other child, piling on the stuffed toys and rolling up in a blanket helped. Tags on their shirts bothered them and I used to cut them out. But over time, they’ve gotten used to those pesky tags. I’ve even tried the sensory diet – I really liked putting velcro under the coffee table and running my fingers over it. I agree somewhat with Robison says about sensory issues. Sometimes, they can’t be overcome, though, but there are some that we have to figure out how to get around, because they’re ever present. One thing I’ve noticed is that people with Asperger’s and very mild classic autism seem to be hypersensitive, always overstimulated and looking for refuge from the world. People with more severe types of autism are usually hyposensitive, and their life seems to consist of sensory seeking. It’s hard to know when to push and when to give in to certain sensory issues. I think food is a good example where we need to take very small baby steps in moving toward a balanced diet with varying textures and tastes, otherwise someone will end up so averse that they only eat one or two things. Thank you for this post. We’re just embarking on the journey of SPD with our little girl, trying to find ways to help her become settled and more functional. It’s wonderful to read the experiences of others. It makes me feel not quite so alone. Thank you. My son may have SPD and we are working with the birth to 3 program. I like to read other people’s experiences. We have not yet started making dietary changes but obviously it is something worth considering. Thanks for this post. Lots to think about. I’m interested to read the book, as well. Love the idea of the pillow tent. Thanks for sharing! 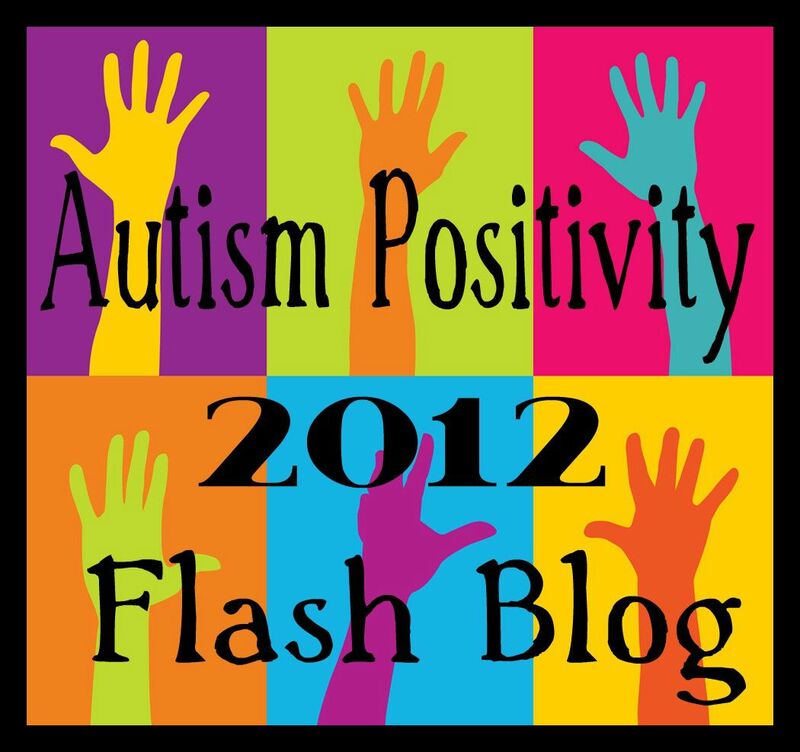 got you added to the autism blogs directory. Can you post the link to your blog post here??? That would be so great! This is SO insightful! My son is 3 and has SPD and I am planning to implement some of the ideas. Thank you! Also, do you have any tips for kids who additionally become emotionally overwhelmed when situations move beyond their control? My son has started lashing out and I am reading a book “No More Meltdowns” by Jed Baker which is really helping so far, but just wanted to ask someone who has been there. Again, thank you for this post, I’ll be sharing it if you don’t mind! I am an adult, and I still cut tags out of shirts and will continue to do so. As long as I don’t damage the clothing while doing it, what does it hurt? You know what? I love that now so many of my own clothes have the ‘tags’ printed instead of sewn in. I wrote this post originally a couple of years back – and though I still want my child to build resiliency – I feel my thinking is shifting as I have greater understanding of the importance of supporting the development of his advocacy skills.